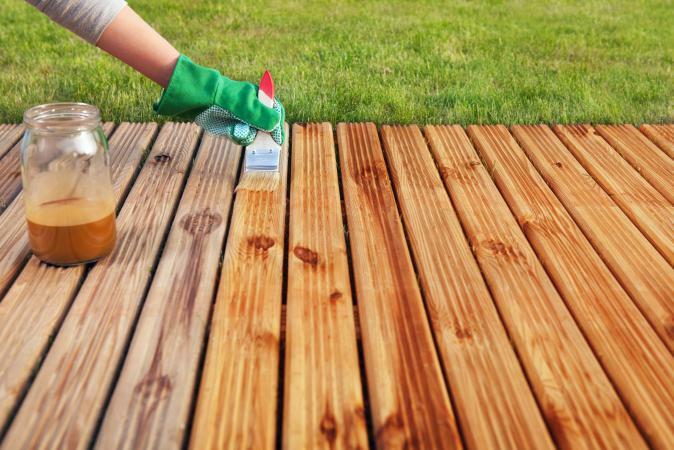 Deck wood stains should last between three and five years before you need to re-stain. Products from three brands-Behr, Olympic and Cabot-get top ratings from consumers and consumer review sites alike. According to Consumer Reports (CR) and Consumer Search (CS), Behr Deck Plus Solid Color Waterproofing Wood Stain is one of the top-rated deck stains by users. Consumer Search states that Consumer Reports places this Behr product in second place with a "Recommendation" and the "CR Best Buy" designation. The latter is given for impressive performance and value. In addition, CR bestowed a "Very Good" score for the appearance of the deck after three years. Some user reviews were dissatisfied, stating that the deck finish began peeling after a year. CS points out that CR had no such results in their testing and offered a possible explanation for the peeling issues: improper application (applied too thickly). Home Depot states that Behr's Deck Plus Solid Color Waterproofing Wood Stain must be tinted in-store with the color of your choice. The many color options make this a very valuable stain for those wishing to use something other than a wood color. Home Depot reviewers are satisfied overall, except for those reporting peeling issues. "Coverage was excellent. The color was exact to the color chart." "Coverage is great and dries in a couple of hours. " "I used this stain on my log home that is nearly 30 years old. The new stain, brown, covered beautifully and with just one coat." "We had repainted the deck 2 years before and the coating peeled off. This was due to poor prep more than anything so this time we tried to do the job right." According to Consumer Reports, Olympic Maximum Solid Stain & Sealant in One is rated in their top solid wood stains category, coming in slightly behind Behr. According to Consumer Search, the test deck had a "Very Good" rating in appearance after three years. The product has a 10-year limited warranty for decks. The stain showed good resistance to common problems, such as color change, mildew and cracking/peeling. Environmentally friendly, the stain contains less than 100 grams per liter of VOCs (volatile organic compounds). Most Lowe's customers were satisfied with Olympic Maximum Solid Stain & Sealant. "Two coats were required to cover well. I am very pleased with the matte finish and it cleans easily with the squirt of a hose or with just rainfall." "Great color selection, fills minor imperfections, cracks and holes in the wood." "Very durable, but still lets the texture of the wood show through." "I've used Olympic Maximum Stain for over 10 years. It has GREAT durability in all kinds of weather from the cold winter temps to the blazing, southern sun of summer." Cabot wood stains receive two notable endorsements. One is from Bestcovery and the other is from Best Reviews. Bestcovery ranks Cabot wood stains as the best stating, "This is widely considered the highest quality wood stain on the market." The website continues, "All the colors are 'colorfast' so they will not fade with time." Best Reviews rated one of Cabot's products, Alkyd/Oil Base Wood Toned Deck & Siding Stain, as the "Best of the Best" among deck stains. The group purchased deck stains, and the products underwent 68 hours of use and observation. The website interviewed one expert and over 100 consumers. Both Amazon and Google customers are satisfied with their deck staining results. Amazon customer: "Excellent quality. Has long life do not have to keep reapplying, going on 3 years still looks good." Google review: "Best finish, longest lasting, and easy to apply." Some reviews complain about peeling while another reviewer reminds that the deck wood must be cured between six and 12 months (something a few failed to do) before applying any type of finish. It helps to read the deck stain reviews before deciding which stain to purchase. Also be mindful to avoid any shortcuts in deck preparation. Failing to clean, sand and power-wash before staining can result in the stain peeling from the deck.